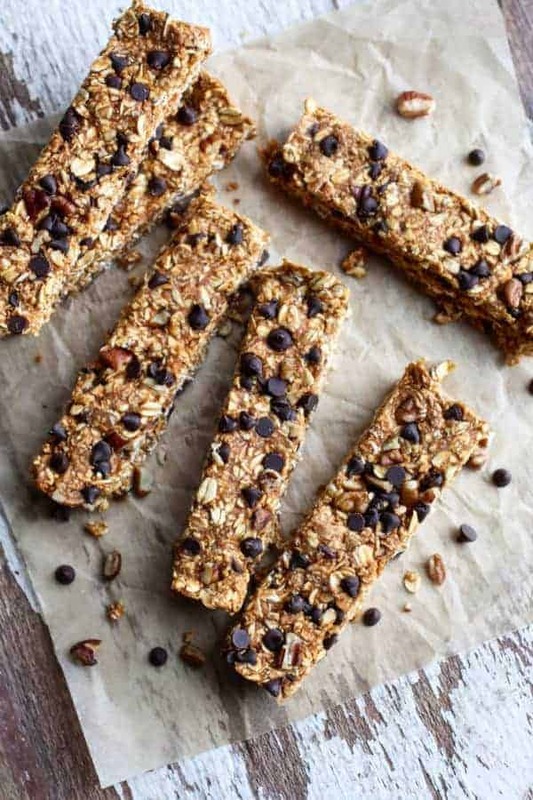 These no-bake granola bars are infused with antioxidant rich pumpkin, flavored with pumpkin pie spice and studded with chocolate chips. The perfect pre-workout fuel, grab-and-go breakfast, lunchbox addition or afternoon treat. I love finding new real food options that I can enjoy as pre-workout fuel. I’m not one to go to a morning CrossFit class or out for a morning run on an empty stomach. I need a little something in my belly but know that if I eat too much, I’ll end up with a side stitch or if it’s a tough WOD that consists of jumping and/or being upside down it could result in losing my breakfast. Ummm…no thanks! Pre-workout fuel is very individualized. You have to find what works for you and that might require trying several different foods and food combinations. Most recently, I’ve been loving these No-bake Pumpkin Chocolate Chip Granola Bars so these may be something you’ll want to try, too. They provide my body with just the right amount of nutrients so that I have the energy I need to crush a morning workout. They’re easy to make, crazy delicious, hold-up nicely in the fridge for 7-10 days and freezer-friendly so feel free to double the recipe if you’d like to tuck some away in the freezer for future. 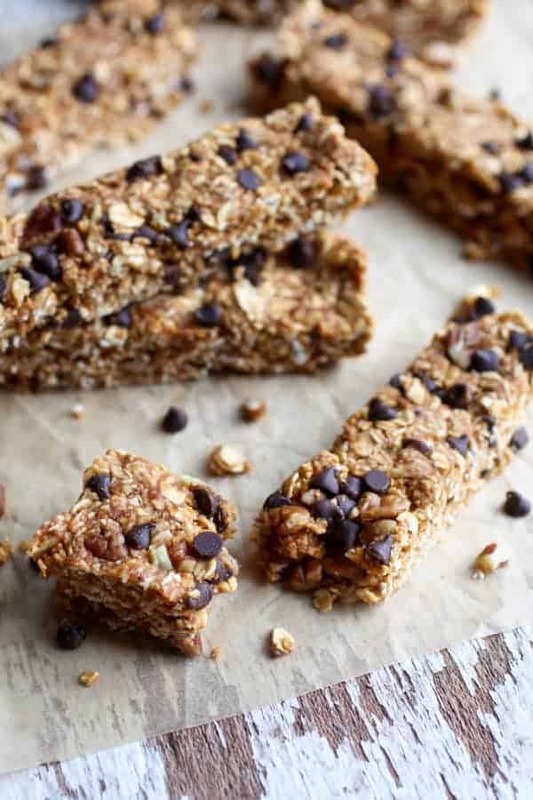 While you can easily purchase a box of granola bars at the grocery store, making them yourself has major perks because you’re in control of what goes into them and the amount of sweetener that’s added. Plus, they taste better and they’re easy enough for kids to make! I know you’ll love these Pumpkin Chocolate Chip Granola Bars that are gluten-free, nut-free (omit pecans) and egg-free. 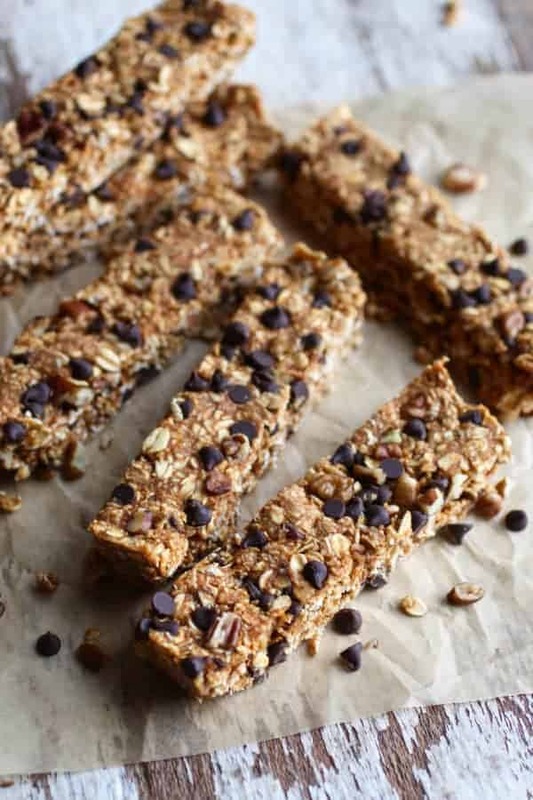 You can also turn these No-bake Pumpkin Chocolate Chip Granola Bars Granola Bars into energy bites if you wish. Whether they’re bites or bars, they also make for a perfect lunchbox addition for kiddos or an after school snack. If your kids go to a nut-free school, simply leave out the pecans and replace with sunflower seeds of pepitas. Shane, my husband, isn’t one to sit down for breakfast before he heads out the door for work. 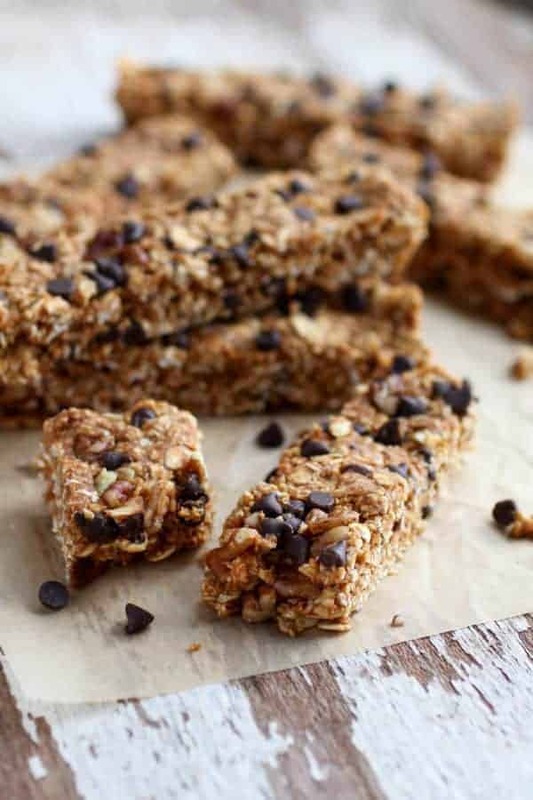 He’s all about the grab-and-go kind of a breakfast so these No-bake Pumpkin Chocolate Chip Granola Bars have been a great option for him. In this case, I’ll add a couple scoops of protein powder, like vital proteins collagen, to make them a higher protein breakfast bar. If adding protein, you may need to add a little water or almond milk. I recommend adding just 1 tablespoon at a time until the dough comes together. Alright, it’s time to continue the season of all.things.pumpkin and give these No-bake Pumpkin Chocolate Chip Granola Bars a try! In a food process or blender, combine the oats, pumpkin puree, nut or seed butter, syrup, pumpkin pie spice and vanilla extract. Process on low for a few seconds. Scrap sides as needed. Process just until mixed well (note: some of the oats will remain whole). Transfer mixture to bowl. Fold in pecans and chocolate chip. Line a 9 x 5 inch loaf pan with plastic wrap or parchment. Transfer mixture to loaf pan, spread out and press down firmly (very firmly – this is important). Place in freezer for 30 minutes before slicing into 8 bars or 10 squares. Bars hold up best if stored in an airtight container in the fridge. These look so addictively chewy and sweet! Love the use of pumpkin puree too – tis the season! Oh, so chewy! And pumpkin IS a vegetable so these could ALMOST pass as breakfast or ‘health food’, right? Oh my gosh these remind me SO much of my old favorite chocolate chip chewy bars from growing up!! Making these for suuuure. Yesss! That’s what I was thinking too! 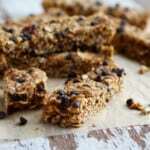 I love granola bars, and these look like the perfect combo for fall. I love this recipe! So, love the simplicity of the recipe. However, why is it ok to eat oats uncooked? Can a body still absorb the nutrients from the oats when the oats are raw? I would think it might taste better and be more absorbable if the oats were toasted in a frying pan first, no? Oats are fine to eat uncooked. In fact, muesli is uncooked oats that are briefly soaked in milk and are considered to be a very nutritious food. Toasting the oats would give this recipe a great flavor. Do you think the pumpkin could be replaced with apple sauce and it still come out right? That should work. Maybe go with 1/3 cup nut butter and 1/4 applesauce for a more sticky texture. Let us know how they turn out if you try them! I made these yesterday and they are really good! Very easy – I followed the recipe exactly except I made it x1.5 (I didn’t have enough oats to double it, lol) – all in one batch, pressed into the same pan. That allowed me to cut 13 bars crosswise in about .75″ segments (give or take) that roughly match the size of what’s shown above in the picture. So how are they? I will say they developed more flavor as they sat in the fridge for a few hours. At first I mainly tasted oats but later the pumpkin spices came out more, so give it a little time. They cut nicely if they’re packed firmly, but use a sharp knife and a steady hand. They’re definitely soft, and they’ll fall apart if you saw or move the knife too much. All in all, I’d make these again – possibly add dried unsweetened cranberries next time. They make a great guilt-free post workout snack! I had one this morning with a cup of green tea and it was divine!! Thanks for another great recipe ladies.